The Wide and Wonderful World of Custom Roman Shades – Back Bay Shutter Co. 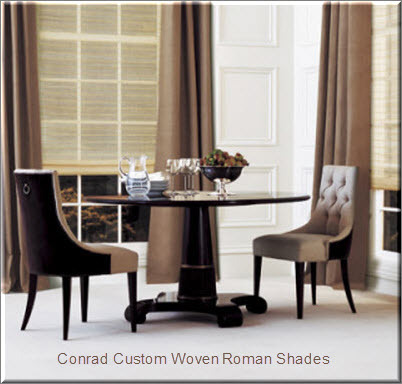 Custom roman shades are an elegant and versatile solution to any home’s decor. The name seems to come from shades used in the ancient Roman Coliseum, where long poles were extended from the edge of a seating tier and pleated fabric was hung to offer spectators some shade, and then retracted when not in use. Today, roman shades come in a wide variety of styles and fabrics that mimic and improve on the original design and purpose of the shade. Roman shades offer you many options for controlling the amount of light in a room, they offer you further privacy, and they help to protect your furniture and electrical appliances from direct sunlight. Most commonly, roman shades are used indoors to transform the aesthetic of a room by controlling the amount of light and by accenting the window with fabrics, cornices and valances that complement the room. Flat roman shades are flat when lowered and can be hidden completely within an elegant cornice when raised. To complement or transform your interior, you could choose from such options as canvas, bamboo, woven fabrics, and cord pull, cordless, and motorized models. Hobbled shades are made from twice as much fabric as the flat models and retain their deep pleats when lowered. Teardrop models are raised in the center of the shade, producing the folds that give the model its name, and tab top models are generally hung from decorative curtain rods. Each of these models can be fully motorized and can even be integrated into a comprehensive energy efficiency system within your home. Finally, custom roman shades can make your home’s lighting look softer or more dramatic; they can protect your furniture from fading; they can offer you more privacy; and, all this can be motorized or built custom to suit your exact needs and specifications. As you can see, when it comes to adding drama, beauty or function to a room it truly is a wide and wonderful world of custom roman shades!